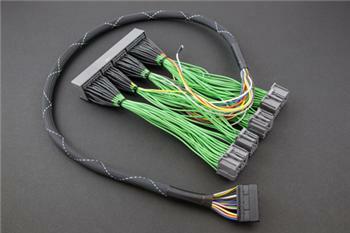 These are harnesses for the use of Haltech’s Platinum Sprint 500 unit. The Platinum Sprint 500 has full control of fuel and ignition timing. Eight and six cylinder engines will be converted to batch injection in the Boomslang harness. Direct fire eight and six cylinder engines will be converted to wasted spark in the Boomslang harness. The factory check engine light is controlled by the Platinum Sprint 500 if possible, unless otherwise requested.